We opened in 1980 as a western-style restaurant and have been a certified restaurant for curry promotion since the "Curry City Yokosuka" initiative started in 1991. We offer "Yokosuka Navy Curry," which is cooked based on an old Japanese Navy's recipe from the "Navy Culinary Arts Reference Book," published in 1908. Based on the original navy curry recipe, each restaurant has its own specialty. Our specialty is using large and fresh carrots and potatoes that have been produced in Yokosuka. We put extra care into maintaining the shape of the vegetables in the process. Our curry roux contains a lot of vegetable extract that brings out the flavor of the meat and vegetables. Milk is served together with the curry. This curry is cooked based on the same recipe used in JMSDF's experiment ship, "Asuka." We faithfully reproduce the cooking of the ship's chef. It includes plenty of potatoes and fruit, which give the country a hint of sweetness. The owner put years of dedication into creating the Yokosuka Navy Curry Spoon, which makes it very easy to scoop! This spoon is durable and has the word "YOKOSUKA" inscribed onto it as well. 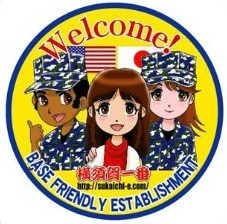 It makes for a great gift from Yokosuka! It's sure to make people happy when they receive it. Let's have some Yokosuka Navy Curry! Our Yokosuka Navy Curry Spoon also serves as a great souvenir from Yokosuka! Afterwards, we recommend visiting the Memorial Warship Mikasa, hanging around Dobuita Street, or stopping by Verny Park. Enjoy! We currently have a local junior high school student in training as part of a career support program. He's a hard worker and is very attentive to our training. We hope for nothing but the best of his future.